As long time members of the Education Market Association (EDmarket), Worthington Direct will join fellow dealers and furniture manufacturers for the 2014 Edspaces Conference and Expo for Innovative Learning Environments. This industry event is the most important international conference and expo for professionals who design, supply and manage creative learning environments and is being held in Tampa, Florida between October 29th-31st. The sole purpose of this show is to continually improve the outcome of student success by progressing learning environments for the entire K-12 educational system. Most furniture manufacturers do not sell direct to schools and organizations, but rely on trusted dealers like Worthington Direct to bring their products into the marketplace. This show is an important time for dealers to get hands on products and really evaluate how these wares can better assist their loyal customers. Most Worthington Direct employees have at least 10 years of experience in the K-12 marketplace, so they know what will work in the real world, and what perhaps still needs time to mature. 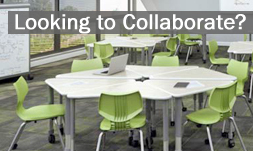 We expect to see further development in the collaborative learning furniture models. A couple of years ago only a hand-full of manufacturers were making collaborative furniture, such as Smith System and Paragon, but now almost every traditional educational furniture maker has a new, unique shaped desk to can create an endless array of modular groups. Mobility is a big factor now too. Everything needs a caster option! Furniture that can span the gap between corporate and the classroom are also sure to turn heads during the conference. Pieces with powered options to accommodate technology and distance networking may give some educators sticker shock, but those that can afford it will want it now. Edspaces 2014 will host exhibitors, dealers, architects, designers, facility planners, and now this year- school and college business officials. Highlights of the expo include the 2014 EDspaces Innovation Awards, sponsored by IIDA and publication partner, Learning by Design magazine. Over 30 educational sessions that range in topics from STEM planning and how architecture shapes pedagogy, to bond passing strategies and obesity prevention. Most of these sessions will earn educators credit towards their Continuing Education Units (CEUs). For a full list of sessions, view the 2014 Edspaces Show Program. Look for highlights and images across the web using the hashtag: #EDspaces2014. If you are attending and see a friendly face wearing a Worthington Direct badge, say hello! < Active Seating- Is it a Right Move for your Classroom?